Preheat oven to 400ºF. Toss squash with oil on a large rimmed sheet pan and season to taste with salt and pepper. Wrap each beet in aluminum foil and add to pan with squash. Roast veggies, turning squash halfway through cooking, until nicely browned and tender when pierced with a knife, about 30 minutes. Remove squash but allow beets to continue cooking until tender, about 30 minutes more. Let veggies cool completely. Peel beets and cut into bite-sized chunks. Transfer veggies to a resealable plastic bag and refrigerate until chilled, at least 2 hours and up to 1 day. Pour oil from goat cheese jar into a small bowl, reserving cheese. Add vinegar, shallots and smoked salt and pepper, whisking to combine. Dressing can be made and refrigerated for up to 1 day in advance. In a large bowl, toss arugula with about half the dressing. Divide arugula between 8 dinner plates. 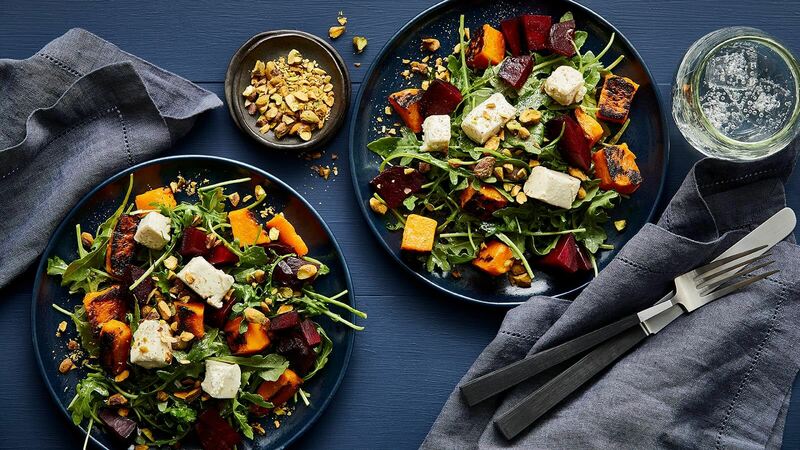 Place equal amounts of butternut squash, beets and cheese on top of arugula. Sprinkle with smoked salt. Drizzle with remaining dressing. Scatter pistachios on top and serve immediately.